The Winner The TaylorMade Spider Tour is the best mallet putter on the market due to its terrific balance and large sweet spot. For the golfer looking to shave strokes on the green, the Spider provides an elite option. 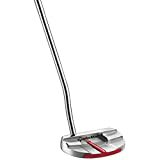 With a soft Pure Roll insert to help the golf ball roll true and straight, the TaylorMade Spider is the best mallet putter for any level of golfer. 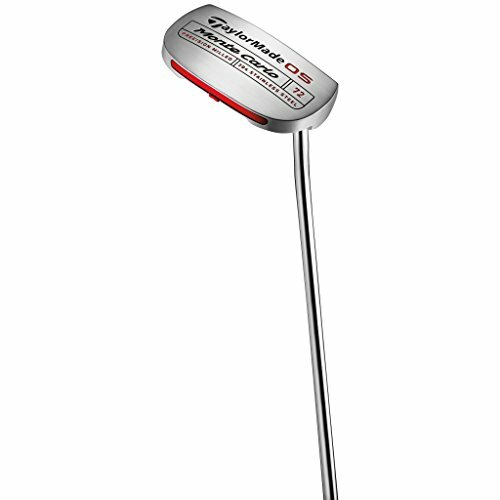 One of the most popular mallet putters on the PGA Tour, the TaylorMade Spider Tour is an absolute beauty. With technological enhancements that aided in creating the most balanced putter on the market, TaylorMade has crafted a mallet that places a strong emphasis on feel throughout the putting stroke. With a variety of hosel options, TaylorMade has catered to golfers that utilize any putting stroke. Mallets are typically designed for the golfers who prefer a straight-back and straight-through putting stroke, but the Spider Tour has options for golfers who would rather use the arc-stroke method. But the question most golfers ask when purchasing a putter is: How does the Spider Tour roll the golf ball? Golfers can rest assured that the Spider Tour’s Pure Roll insert does the job of preventing skidding and provides exceptional feel as well as propels golf balls off the face with a smooth roll. Outfitted with a SuperStroke grip that reduces the hands from twisting through the stroke, the Spider Tour can aid any putting stroke with solid and exceptional performance. Adjustable weights allow the golfer to tinker with the Spider Tour to get the perfect feel from anywhere around the cup. 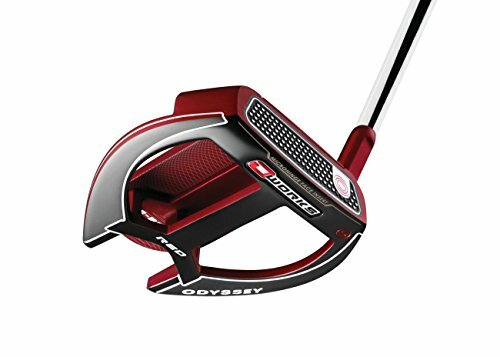 Odyssey’s line of Red O-Works putters has continued to be a staple on the best putters of the year lists throughout the seasons. Their putter known as #7, is a modified mallet with a double bend hosel, perfect for arc-stroke putting. The #7 has a fanged style on the putter head with weighted alignment wings to assure the golfer of a reliable and consistent stroke each time they hit the course. The #7 features the stunning red finish that is all the rage across professional golf these days. What sets the #7 apart from other mallet putters is the Microhinge face that touts improved feel and exceptional roll from anywhere on the green. At first glance, golfers could look at the Microhinge metal face and worry that it might be too abrasive for contact with the golf ball. But Odyssey has included an insert behind the face to dampen and improve feel at impact. The Microhinge face has been milled to prevent skidding and bouncing after impact assuring the golfer of a pure roll. Perhaps one of the most underrated producers of quality putters, Cleveland has outdone themselves with the introduction of the Huntington Beach line. 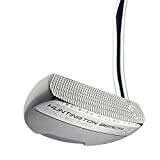 With a variety of blade and mallet putters to choose from, Huntington Beach putters share a uniquely precise milled face for exemplary feel with each putt. 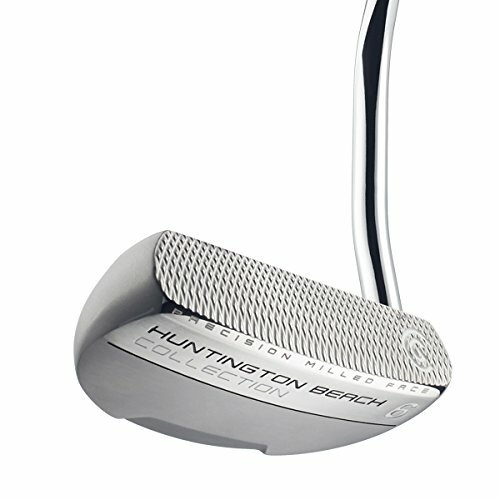 The #6 Huntington Beach putter from Cleveland is a sleek, silver mallet that offers extraordinary performance in an affordable package. The double bended shaft of the #6 is perfect for the golfer who uses the straight-back and straight-through putting stroke. One of the best features about the #6 putter is how forgiving the putter is for higher handicap golfers. The half-moon mallet has a single alignment line down the center of the area behind the clubface. The putter is face-balanced to guarantee solid contact through the putting stroke. Due to the face being balanced, the #6 works hard to make sure that putts stay online and find their way toward the hole regardless of where the contact occurs on the clubface. For the golfer trying to decide whether or not to make the switch to the mallet, the Cleveland Huntington Beach #6 is an excellent option for testing. 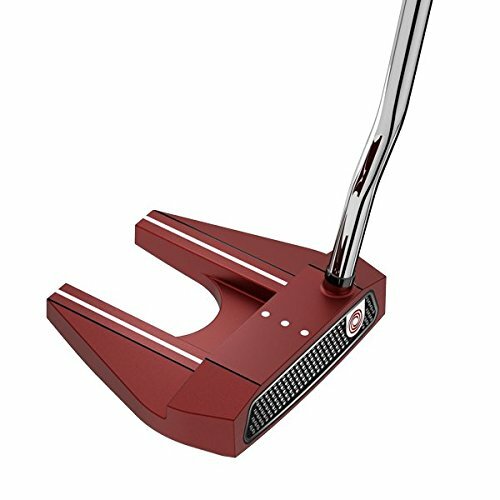 A classic putter that has been used over the decades gets a stylish and productive redesign as Odyssey has introduced the Red O-Works 2-Ball S Fang mallet putter. Draped in a very stylish and tour-inspired red, the 2-Ball S Fang mallet features perimeter weighted fangs that help establish a broad and balanced club head. The added area of the 2-Ball putter head improves the accuracy of putts from a variety of distances. 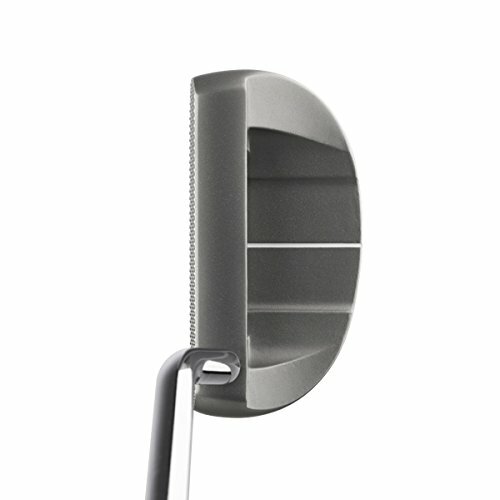 Odyssey has included a Microhinge insert on the 2-Ball S Fang to improve the immediate forward roll after impact. The insert features a high launch angle which lifts the golf ball into the air and gets it moving along the putting line quicker and without skidding. The 2-Ball S Fang excels when lining up putts. The flat two ball alignment guide, which is featured behind the center of the clubface, helps pros and amateurs with maintaining the proper line for a successful putt. Adorned in colors that are commonly found on the PGA Tour makes the 2-Ball S Fang a head-turning addition to any amateur’s bag that will undoubtedly draw the attention of all their friends. 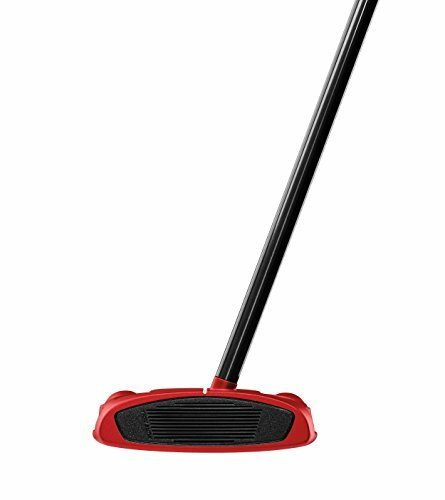 With a large footprint behind the clubface that keeps the ball online, the TaylorMade Big Red Monte Carlo mallet is one of the most dependable putters available to amateurs. The footprint has a long white over red line that assists in consistently lining up and making correct contact with the golf ball on each successive putt. TaylorMade has removed a lot of the weight from the club head of the Red Monte Carlo by replacing that removed aluminum with a composite insert to widen the area of the clubhead for better balance and response on putts. With the added area provided by the rear insert, the boosted Moment Of Inertia, or MOI, of the Monte Carlo prevents the twisting during impact. The club sits evenly on the ground for a balanced setup that aids in helping the takeaway stay on the putting line. The Monte Carlo mallet has a milled clubface that provides a true roll and exceptional feel from the putter. The Red Monte Carlo from TaylorMade looks incredible with clean, sharp edges and a contrasting silver and red color scheme that is a stunner. 8.0.1 What Makes A Great Putter? 8.0.2 The Difference in Putting Strokes? 8.0.3 Face Balanced vs. Toe Balanced? 8.0.4 Mallet vs. Blade Putter? 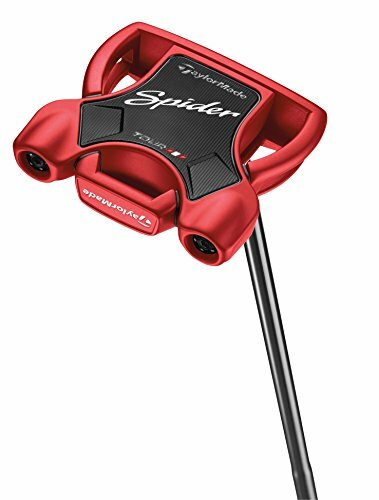 The TaylorMade Spider Tour putter is an excellent option for golfers looking to vastly improve their consistency on the green. The head of the Spider Tour is made with lightweight aluminum for a solid frame that delivers high performance from putts of all lengths. The Spider Tour is used on professional circuits by such major winners as Dustin Johnson and Jason Day. The pros respond to the lightweight 360-gram putter head that enhances tempo and assures solid contact every time. Perfect for golfers who want to cut down on the twisting of their hands, the Spider Tour, with a SuperStroke grip, alleviates those issues for a smooth and calm stroke. The Spider comes with four different hosel choices. The most popular option is the Small Slant hosel, which is the preferred hosel by Johnson and Day. The Small Slant is made for an arching stroke and a finish that releases the putter. The Double Bend hosel is an ideal option for golfers who want to carry a straight-back and straight-through putting stroke. The Center Shaft hosel is another unique feature can be found with the fourth choice for the Spider Tour. The Center Shaft places the shaft and putter head connection directly behind the center of the putter face. Our Verdict Featuring a soft surlyn Pure Roll insert on the face, the Spider Tour mallet provides steady control and enhanced feel on long distance putts. The milled stainless steel face coupled with the vibration-dampening foam placed between the body and frame increases the level of feel and quality of sound as the ball comes off the putter. Odyssey has been on top of the putting world for many years, and their streak continues with the Red O-Works line that includes the fabulous #7 model. For the golfer purchasing a new putter, the most important thing they must focus on is how the ball feels when it leaves the face. If the ball pops up or jumps from the face, chances are the ball won’t roll with any consistency along the intended putting line. So to combat this problem, Odyssey has introduced the Microhinge insert. The crown jewel of the Red O-Works #7, the Microhinge insert is revolutionary in the way it creates smooth topspin off the face regardless of the type of stroke you use. The stainless steel plate insert is molded into the Thermoplastic Elastomer Feel Layer to provide for incredible feel and enhanced roll. The lined weighted wings that rest behind the clubface are perfect for golfers that want a larger footprint behind the golf ball before impact. The clean and sleek look of the top of the #7 putter head provides a clear alignment and outstanding contrast that allows the golfer to cleanly see the golf ball at address. Underneath the club head, two weights create additional balance and prevent the club from moving through the stroke. May not be the right choice for the golfer looking for traditional mallet who doesn’t like the fanged wings of the putter head. Our Verdict With an assortment of features, the #7 is ideal for golfers of all skill levels. From the Microhinge insert to the fanged weighted wings, the Odyssey Red O-Works #7 putter is a stable and reliable performer that will save strokes from the moment you first take it on the green. Cleveland has created a real workhorse of a mallet with the Huntington Beach #6 putter. With a clean look and solid feel, the #6 putter delivers high performance at an affordable price. The heart and soul of the #6 mallet from Cleveland is the precision milled face. The diamond-shaped pattern of the milling is coarse and measures four times deeper than previous classic Cleveland putters. The deeper milling results in greater feel at the point of contact while also increasing the friction between the ball and the milled face for a truer and more consistent roll on the greens. The #6 mallet belongs among the best mallet putters because of the performance of the golf ball once it leaves the clubface. The precision milled face grabs the golf ball and prevents that dreaded skidding that can toss a putt offline and away from the hole. The more friction the putter face generates with the golf ball, the truer the roll will be in the final product. As a result of the enhanced milling, amateurs who use the Huntington Beach #6 find a more consistent stroke that leads to lower overall scores. The #6 putter has a clean and crisp look that enhances the contrast with the golf ball at address. The half moon mallet has a long alignment line directly behind the clubface for easy connection to the putting line you need to sink the upcoming putt. Our Verdict Cleveland has created the ideal putter for amateurs who want the benefits of a mallet without using a clubhead that is too big or cumbersome causing a loss in focus when you need it most. The 2-Ball design from Odyssey has endured for decades as one of the favorite putters for the weekend warrior to the PGA professional. The mallet putter has won fans over from all over the world with its consistent performance and unique look. Odyssey has taken the classic 2-Ball design and enhanced it by adding two weighted fangs to increase balance and surface area. 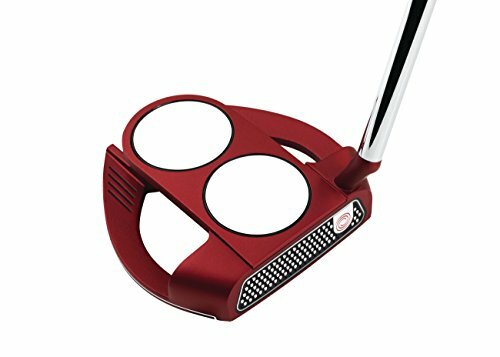 The new and improved Odyssey Red O-Works 2-Ball S Fang putter is one of the best mallet putters that the company has ever created for public consumption. With the weighted fangs, the 2-Ball S Fang putter has spread the weight around the clubhead to improve the weight distribution. By evenly creating a larger surface area, the 2-Ball S Fang has increased the MOI, or Moment of Inertia, which helps putts roll with more consistency. Adding to the more consistent roll is a Microhinge insert that is the result of millions of dollars in development by Callaway, Odyssey’s chief company. Out of the research and development comes an insert that provides high launch angle to get the ball in the air and moving forward quicker than any previous insert Odyssey has created. In addition to the new and improved face insert, Odyssey has included a layer behind the face known as a Thermoplastic Elastomer Feel Layer that absorbs and then transfers energy onto the golf ball for better feel and to help lift the ball upward and forward. The new and improved Microhinge insert provides immediate forward roll for enhanced feel as well as more control when striking mid-range putts. Our Verdict The 2-Ball S Fang putter is a welcome addition to the Odyssey family of mallet putters with incredible technology advancements as well as performing at an incredibly high level. 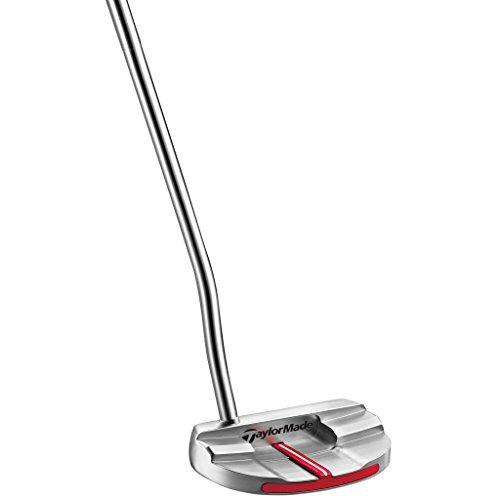 TaylorMade’s TaylorMade Big Red Monte Carlo mallet putter is a machine on the green. From the alignment footprint that exists in the latter area of the club to the superior weight distribution through the use of a composite insert, the Monte Carlo is one of the best mallet putters for the amateur looking to take the plunge with new hardware on the green. 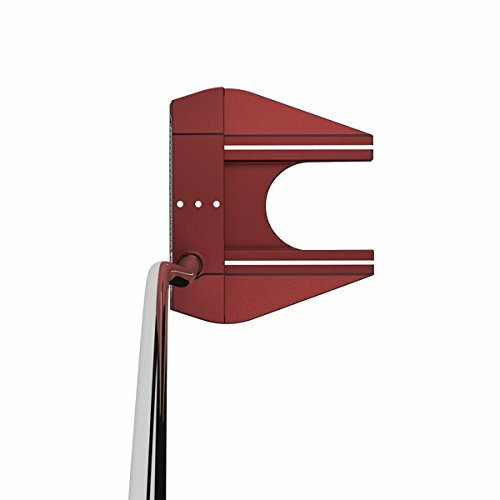 Starting with the area behind the clubface, the Monte Carlo has a clear and contrasted white on red line that aids in assuring that that golfer has the ball correctly lined up at address. Next, the clubhead gets a technological boost by removing a lot of the aluminum and replacing it with a composite insert that is lighter. The insert allows TaylorMade to make the clubhead larger so that the company can increase the MOI on the face of the Monte Carlo. When you couple the additional MOI with a milled clubface that significantly enhances the roll of the golf ball, the Monte Carlo provides a mallet putter that can perform alongside the best golf manufacturers can offer. Another feature we love about the Monte Carlo is that the wide sole of the club sits evenly along the ground allowing the golfer to balance their setup. When taking the clear alignment line and the simple setup into account, the golfer will also find that the club won’t twist through impact. Our Verdict As a result of these features, the Monte Carlo provides the maximum amount of forgiveness and stability that an amateur will likely see in an off the shelf mallet putter. TaylorMade N1538326 Big Red Monte Carlo Super Stroke Putter, Right Hand, 34"
Putter heads usually come in one of two options: a blade-style or mallet-style. A blade is perfect for the golfer looking for more control with their putting stroke. Mallets are more balanced, heavier and ideal for the straight-back and straight-through swing. Finding the perfect length of a putter shaft is crucial for maintaining a consistent putting stroke. If you buy one that is too long, it could create problems with the shortening of your arms. Shafts that are too small have the opposite effect of reaching with the arms through the putt. Finding the right putting grip is generally about finding the grip that fits your hands. Larger hands with long fingers seem to like the thick SuperStroke grip that helps prevent twisting through the stroke. Smaller hands should seek out the thinner, more traditional putting grip for stability. The location of the hosel can be significant for a golfer looking to improve their putting game. Most blade putters have the hosel located to the inside of the club, closer to the golfer’s body. Some mallets, however, located the hosel in the center of the club head to improve contract and location of the contact. Carbon steel is commonly chosen as the best material for a putter head. Coupled with face inserts that are milled and created from softer compounds, the head of a high-quality putter will be balanced and prevent the skidding of a golf ball for truer roll and more online putts. The Difference in Putting Strokes? The straight-back and straight-through putting stroke are made when the golfer brings the putter back on a straight line and then moves the putter forward on the same line to the golf ball. The center of the putter face and the contact spot on the golf ball are aligned with this stroke. 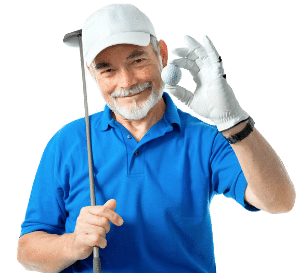 An arc-stroke is made when the golfer brings the putter inside the golf ball on the takeaway, then returns the putter to the center of the golf ball on the follow through. Most golfers use blade putters for this stroke as they are toe balanced and therefore, easier to control for the arc-stroke. The inside-down-the-line stroke is a variation of both the arc and the straight back-straight through stroke. On the takeaway, the putter moves slightly inside the golf ball then comes back online and stays online through the putting stroke. For shorter putts, the inside-down stroke has gained popularity due to its improvement in accuracy. Face Balanced vs. Toe Balanced? A face-balanced putter is manufactured in a way that makes it hard for the golfer to twist the clubface through the putting stroke. By preventing the opening or closing of the club face, the golfer can keep the putter on path by taking the putter straight-back and straight-through the golf ball. Mallet putters are typically face balanced to aid the golfer in keeping their putts on the correct putting line. A toe-balanced putter is the preferred choice for golfers who like to make an arc-style stroke. To help you understand the path of an arc stroke, imagine that you are standing over the golf ball and the point of impact is the peak of a very wide yet shallow arch. The center of the putter face will come inside the golf ball on the backswing and then return to the square position when contact is made. Professional golfers prefer the arc method with their putts because it allows for more control. Many find the straight-back and straight-through method to be less forgiving and void of taking into account what works best for the golfer. One of the main things that amateurs overlook when buying a putter is to take into consideration how the specifications of the club will affect their swing. Putters are offered in a variety of heights, weights, and lofts. It is crucial that the amateur take those factors into account when settling on the putter that is right for them. Golfers looking to improve their putting have typically settled on trying to choose between a mallet and blade putter. When you closely look at both versions, there are many similarities despite the difference in shape. The face of both putters are short in height, and the majority of mallet putters have a hosel located on the inside of the club, close to the golfer’s body, like blade putters. The differences between the two clubs start with the difference in the shape of the putter heads. Mallet putters have heads that are typically square or block-like in style. Newer mallet putters have taken on a new dimension with a stylish flared look. In contrast, blade putters are long and thin, much like the blade of a knife. With the larger club head, mallet putters have more weight to utilize when establishing the balance of the putting stroke. 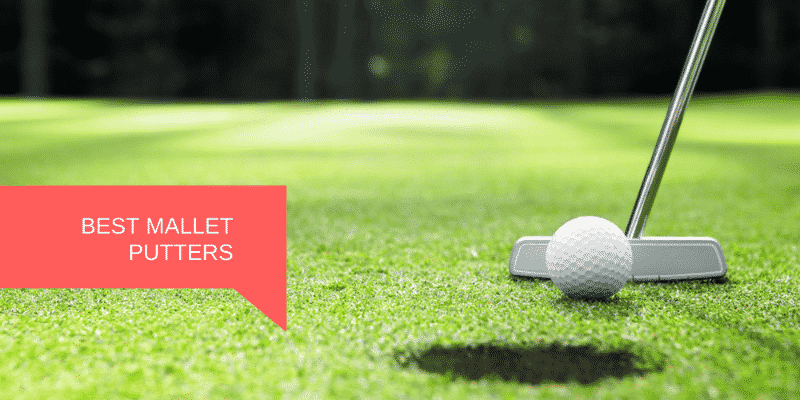 Amateur golfers love the stability of the mallet putter for a straight-back and straight-through putting stroke. Manufacturers have included adjustable weights on the sole of the latest mallet putters to help the golfer get the exact feel they want when striking the ball. Another feature that excels with the mallet putter is alignment when addressing the golf ball. With the large head, golfers have a clear path to seeing the ball with the enhanced lines provided by the extra area behind the putter’s face. Compared to the mallet putter, blade putters need more touch and precision. The lighter weight, as well as the lack of a substantial alignment guide, makes the margin of error smaller for blade users. Golfers that use a blade putter must master an arc stroke to see consistent results from their putting game due to the face being toe balanced. For this reason, most professional golfers that prefer a blade putter do so for their advantage with the arc putting stroke. With superb balance, the TaylorMade Spider is the premier choice for golfers seeking an exceptional mallet putter. TaylorMade’s patented Spider Arc geometry has created a mallet head that features better stability and clearer sight path for improved alignment. The lightweight aluminum clubhead anchored to the stainless steel ring helps keep the putting stroke square throughout the putt. A soft surlyn Pure Roll insert provides greater forward roll and prevents the skidding off the putter face that can create off-line putts. The TaylorMade Spider is trusted by the top players on the PGA Tour and is an ideal addition to the bag of any amateur.